The Duplo DC-616 PRO Slitter/Cutter/Creaser is the perfect finishing solution for the short-run, on demand digital printer. 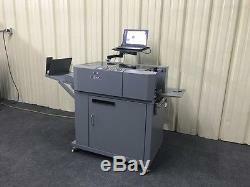 Designed to remove white borders and prevent toner cracking on digital color documents, this all-in-one finisher can process up to 6 slits, 25 cuts, and 20 creases in a single pass bringing efficiency and automation to your post-press operation. Offering a fully automatic setup and quick changeovers, the DC-616 PRO can finish a wide array of full-bleed digital applications including greeting cards, invitations, brochures, book covers, photos, and 24-up business cards without additional modules required. The DC-616 PRO comes standard with the PC Controller software for easy job setup via a PC and the CCD scanner, enabling it to recall any job stored in memory simply by reading the printed barcode and automatically set up the job. The scanner also reads registration marks, correcting the sheet-by-sheet image shift and delivering accurately finished pieces every time. The DC-616 PRO also comes included with a perforation unit, which includes two manually-adjustable perforation tools, to perforate along the length of the sheet. Processes up to 10 sheets per minute. Up to 6 slits, 25 cuts, and 20 creases in a single pass. Standard PC Controller software for easy job setup and unlimited job storage. Built-in CCD scanner reads barcodes and registration marks. THIS MACHINE IS A 2016 MODEL DUPLO DC-616 PRO, IN PRODUCTION LESS THAN (1) YEAR! GREAT CONDITION AND INCLUDES LAPTOP PC ARM AND LAPTOP COMPUTER. The item "Duplo DC-616 PRO Slitter/Cutter/Creaser (2016)" is in sale since Tuesday, June 06, 2017. This item is in the category "Business & Industrial\Printing & Graphic Arts\Bindery & Finishing Equipment\Paper Cutters & Trimmers". 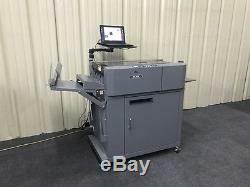 The seller is "uprintfinishing" and is located in High Point, North Carolina. This item can be shipped to United States.